Definitely enjoying this amp!!! The clean is great! The fx loop works very well!! The dirty channel, I like but I have to dial a ton to get that fizziness out..
Was thinking of changing tubes.. Anyone on here have any experience with the Rocker 15 1x10 combo and tubes that help get the fizz out?? 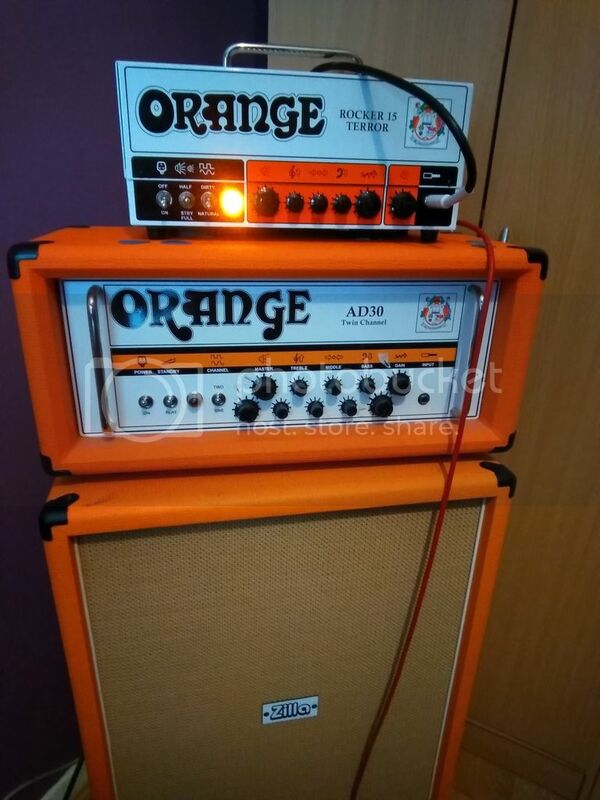 Hi one of the Orange amps I have is a Orange 15 terror....Ive not noticed any fizzy ness with any tubes. I have changed the tubes in mine within a month of getting it but nothing to do with any fizzyness. Popular brands used on here are JJs, Ehx , tungsol... Any of the popular brands really. I'm wondering what volume and what pre Amo gain your using to get the fizz? Are you using little volume with loads of gain? How worn in is the speaker? This will make a huge difference in how it sounds. What's it sound like with volume and gain at 12 o'clock? There should be no fizz now even more so in 7 or 15 watt setting where the amps really opens up. I sold my Rocker combo rather than upgrade the speaker, and planned to wait for a head to come out, which it has obviously. I plan to purchase one eventually, it should be nice through my V30. Or, buy a ppc112 and use the internal speaker with the V30. Two speakers combinaison is great. Thanks! I will most likely get a cab for it. I’m not sold on any of the 10” replacement speakers out there from a elevation eminence or wgs. Went with a Greenback and swapped out the JJ tubes for Genelex Gold Lion el84 and Mullard 12ax7. Fuzziness gone. Individual strings are articulate, chords really ring out, dirty channel is easy to dial in as well. Amp has smoother gain now. Clean channel really woke up as well. Using the Headroom Full 15watt settings. Sounds good at Bedroom Half 0.5 watt. No fuzziness there anymore either. So you went for a 10" green back or a 12" extension cab? Speakers do make a massive difference for sure. Did you do all the changes at once? If you did them step by step, it be interesting to know what did what. I think Greenbacks pair really well with vintage voiced Orange amp. I may tried one in my Rocker 15 and pair it with a ppc112 cab. Went with the 10” Greenback. I put a green back in mine and stacked it on top of a PPC112 and it sounds great now. Orange had their 10" speaker of choice as the Celestion G10N40, their 12" is the Celestion V30. I believe they modelled both their voice of the world speakers after these.... in which case I can see where the sizzle miggt have come from. It's a bright and cutting speaker, and has a very strong upper mids crunch.... or sizzle. I have an Orange AD5 with the G10N40, and understand your description prior to changes quite well. Great speaker for cleans though.